1. Apple profits: Apple sold essentially the same number of iPhones last quarter as it did a year prior, but sales and profits soared as it made more money from higher-priced devices. The tech company posted a $11.5 billion profit for the three months ending in June, up 32% from the same period a year ago. Apple's revenue increased 17% to $53.3 billion, a new record for its fiscal third quarter. The results highlight Apple's successful shift away from depending on selling more and more iPhones in order to grow its business. Apple stock rose more than 3% premarket following the earnings report. It's now within striking distance of becoming the first company to top a $1 trillion market value. Another development to consider: China's Huawei has passed Apple (AAPL) to become the world's second largest smartphone seller, according to research firms IDC, Canalys and IHS Markit. 2. Steeper tariffs? The Trump administration plans to raise pending tariffs on $200 billion in Chinese goods to 25% from 10%, a source familiar with discussions confirmed to CNN. The move is not finalized and could change, according to the source. Talks between US and Chinese officials have done little to ease trade tensions. The United States has already imposed 25% tariffs on Chinese goods worth $34 billion. China immediately responded with its own tariffs on US goods worth $34 billion. A second round of US tariffs on products worth $16 billion could take effect as soon as this week. 3. Tesla earnings: Tesla (TSLA) is set to report earnings after the closing bell. It may be the most closely watched earnings report in the company's history. The electric carmaker just hit an important target for production of the Model 3, its cheapest car. But the company is trying to stop mounting losses and convince investors it can avoid further production line problems. On top of that, CEO Elon Musk keeps making headlines with bizarre tweets and outbursts against critics. 4. Volkswagen's warning: Volkswagen (VLKAF) reported record earnings for the first six months of the year, but warned about challenges ahead. The carmaker said growing protectionism and new European emissions tests pose risks. The company is also still feeling the impact of its diesel scandal. It said it took €1.6 billion ($1.9 billion) charge in connection to the issue in the second quarter. 5. 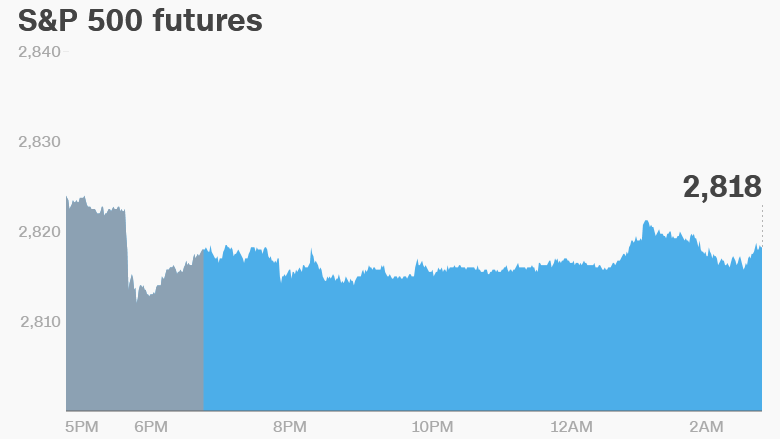 Global market overview: US stock futures were flat. European markets were mixed, following a negative session in Asia. The Dow Jones industrial average closed 0.4% higher on Tuesday, while the S&P 500 added 0.5% and the Nasdaq gained 0.6%. Oil prices slipped 0.8% after a rough trading session on Tuesday. Unofficial estimates from the American Petroleum Institute showed an unexpected rise in US stockpiles. An official report on US crude inventories from the Energy Information Administration will be released at 10:30 a.m. ET. 6. Companies and economics: AMC Entertainment (AMC), Caesars Entertainment (CZR), Ferrari (RACE), Garmin (GRMN), Humana (HUM), Molson Coors Brewing (TAP) and Sprint (S) will release earnings before the open. Allstate (ALL), Boingo Wireless (WIFI), Churchill Downs (CHDN), Fitbit (FIT), T-Mobile US (TMUS), TripAdvisor (TRIP), US Steel (X), Valvoline (VVV) and Wynn Resorts (WYNN) will follow after the close. Shares in Chipotle (CMG) dropped 7% on Tuesday, after customers reported getting sick in Ohio. The Federal Reserve will wrap its two day meeting on Wednesday. The central bank is not expected to raise interest rates, but investors will be watching the statement closely for the central bank's read on the economy and clues about interest rates. It previously signaled that it plans two more rate hikes this year and three in 2019. The Institute for Supply Management will release its ISM Index for July at 10 a.m. ET. The Reserve Bank of India hiked a key interest rate to 6.5% from 6.25% as it works to combat inflation and prevent money from flowing out of the country.